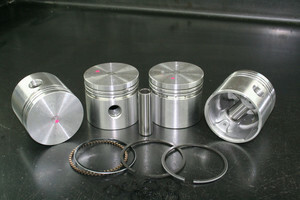 Set of 4 pistons complete with rings and pins. Price has gone up as I have had to buy in Goetz high quality ring sets to go with the remnants of the last 998+20 piston order. We will be no longer making 998 +20 pistons. These pistons are manufactured for race use so are more than adequate for any application allowing up to 12.5:1 CR to be used (with suitably altered distributor advance curve). Also used successfully in turbo equipped engines without any problems.